Hey, Coffee Fans! FC30:C45inally, a hand coffee grinder makes coffee grinding a breeze... even if you're still half-asleep! Why not take a closer look and let Vakoo become your best morning buddy! Quality tested multiple times - Equipped with conical ceramic burr grinders for coffee beans which have been proven to be quieter,last longer, rust-free and absorb less heat than other stainless steel coffee grinders. Grind for any brew - Conical ceramic burr for precision brewing, from coarse to fine, compatible with: Pour Over, Drip,Cold Brew,Herb, or Spice grind. Take it anywhere - Pack the lightweight and compact (detachable to save space) mini burr grinder mill for travel, best coarse grind for french press. Enjoy the time with fresh coffee. Built for convenience - Refilling coffee beans easily by taking off the handle and top cover. Easy-to-clean, ergonomic,for any coffee maker in the world. An elegant look that fits in any kitchen, dining room or gourmet restaurant. Get your morning wake-up call with our handground precision coffee grinder, you're in control of how you begin your great day. Place your favorite coffee beans in the grinder and attach the crank, spin it to desired coarseness/fineness. Our burr grinder is ready to set your mind and soul on a journey for a smooth and tasty sip through happiness. Let your loved ones sleep peacefully while preparing your signature coffee silently and effectively with the non-electric, cordless coffee grinder manual. Dry it before reassembling the parts. Be sure to use fresh, dry beans. Avoid empty grinding or it will damage the ceramic core. Durable & Premium Material - Consists of a heavy duty manual coffee grinder with conical burr mill, brushed stainless steel body and a rust-free ceramic conical burr core. Industrial ceramic with temperature stability,less heat produced and better to preserve the original taste of coffee beans. Dense & Adjustable Grinding - Top rated hand crank conical coffee bean grinder with adjustable ceramic burr, customize the grind size clockwise from coarse to fine. Suitable for coffee beans, herbs, pepper, also great for grinding grain, nut and seed spices. Quiet & Efficient - Ergonomically designed crank handle of extra 5.5inch length, saving your time and effort! Ceramic burr eliminates over 90% noise produced by steel burrs or electric coffee grinders, and don't disturb your loved ones in the morning or colleagues at work. Easy to Refill & Clean - 1.88inch Large wide opening for refilling coffee beans easily. 2 clear windows in the inbuilt plastic static-free cup, help get your required coffee ground. 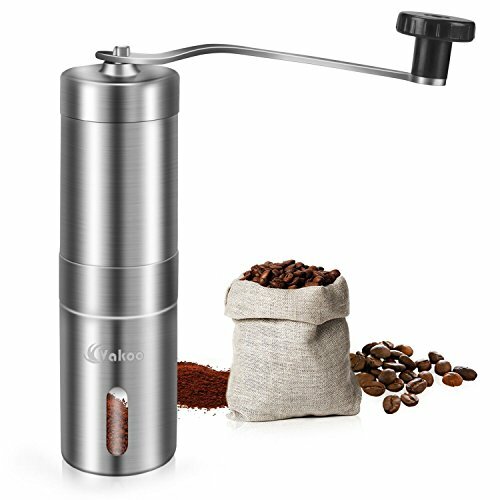 Vakoo hand coffee grinder is easy to disassemble for cleaning without any tools. Compact & Portable - No electricity or batteries required, size: dia 4.8cm/1.88'', 18.8cm/5.5'' long. Portable burr coffee grinder, steel lid to keep coffee in container, allowing you to enjoy fresh ground coffee on your next outdoor trips. 40 Grams capacity, equivalent to 2-3 cups of coffee. Perfect gift for your friends and family. If you have any questions about this product by Vakoo, contact us by completing and submitting the form below. If you are looking for a specif part number, please include it with your message.